Once thought to be a cheap knockoff of Saturday College football the Thursday night college game has become a staple of the season. These Thursday night throw downs started off with much skepticism. Some college football fans and media folks thought that the Thursday night game degraded the product. As the popularity of the mid-week game has increased that negative talk has decreased and even the NFL is now cashing in on the market. The University of Louisville has been a part of ESPN Prime-time College Football Thursday nights since the late 90’s. They were playing on Thursdays before they were cool, and now prepare for another big midweek battle at NC State. Thursday nights have also become a proving ground of sorts. Seems like there have been a few times where a win and loss here can determine how the rest of the season goes. 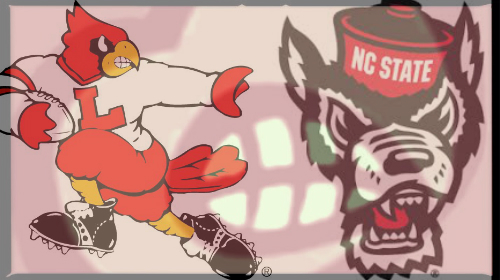 Louisville holds a 6-1 record over the Wolfpack and are 2-0 in Raleigh. They’ll have to keep that winning streak alive if this season is to be considered a success. With a 2-1 record in the ACC the Cardinals can ill afford to drop another game with a challenging schedule ahead. This Louisville team also needs to go out and win this game for confidence. It’s been a while since this group has had a big win in a big prime time match-up. The Cardinals defense allowed just 230 combined yards in the last two wins. That is the lowest total in back to back games in 57 years. But they will face one of the most efficient offenses in the country on Thursday night. The Wolfpack leads the ACC and ranks 7th in the FBS in completion percentage this week. NC State QB Ryan Finley is one of the nation’s most accurate passers, completing 71.9 percent of his throws, and hasn’t tossed an interception in 257 throws dating back to last season. He has passed for 1,403 yards and nine touchdowns in the first five games of the season. This guy knows how to pick apart a defense with his accuracy. Let’s just hope that the Cardinals defense can get a rush on him. Finley’s favorite target is WR Jaylen Samuels who has 43 catches for 321 yards and three scores this season. He ranks 4th in the FBS this week in receptions per game with 8.6 and has caught a pass in 33 consecutive games. It doesn’t end there with this talented Wolfpack receiving corps. WR Kelvin Harmon (301 yards, 1TD) ranks 49th in the FBS in receptions per game (5.4), WR Stephen Louis (253 yards, 2TD) posts the 17th-best career yards-per-catch mark in school history: 15.7, and WR Jakobi Meyers (241 yards, 2TD) had 112 yards on five catches in their big win over FSU. They have all the weapons to beat you through the air and then have guys like RB Nyhein Hines. There isn’t anything this guy can’t do. He currently ranks second in the ACC and ranks 10th nationally with 155 all-purpose yards per game. Hines has rushed for 423 yards (5.0 yards per carry), has 12 receptions for another 69 yards, has 40 yards on three punt returns (13.3) and 255 yards on 11 kickoff returns (23.2). Blocking up front for this talented group of skill position players is one of the best offensive lines in the country. They call themselves the Band of Brothers. The leader of this band is 322-pound RT Will Richardson. They will run a lot of plays behind this guy Thursday night. He has not allowed a sack OR a quarterback pressure in 215 snaps. He has also tallied 11 knockdown/pancake blocks over the past three games. Stopping this group will be one of the biggest challenges remaining this season for the Louisville defense. After getting outplayed by Clemson the Louisville defense has responded well over the last two weeks in wins over Kent State and Murray State. Louisville limited the Golden Flashes to 150 yards of offense and 80 in the win over Murray State. Those performances moved the Cardinals’ defense to 20th nationally against the run yielding 104.5 yards per game and 27th in the country allowing 317.6 yards of offense. Coach Sirmon was also able to work some young guys into the mix. Guys like Amonte Caban, C.J. Avery, TreSean Smith, Tabarius Peterson and Russ Yeast showed that they will be able to help with depth this season. The difference makers this week could be Louisville’s pass rush specialist LB Jonathan Greenard and LB Trevon Young. Young just keeps getting better and better each week. Through five games he is tied for the team lead with three QB hurries, has registered 24 tackles and is second on the team in tackles for loss (5.0) and sacks (1.5). Greenard leads the team with 5.0 sacks and 9.5 tackles for loss coming off the bench this year. The defense will have to get to QB Ryan Finley and not let him just sit in the pocket. I think Greenard and Young could be the key. The story again this season for the Cardinals offense is Lamar Jackson. Through five games he has 1636 yards, 13 touchdowns and three interceptions while also leading the Cardinals on the ground with 72 carries for 437 yards and five TDs. This team goes as Lamar goes. The running game has been coming around and Malik Williams has added another dimension to the offense. He has 389 yards on the season and can catch passes out of the backfield with 127 yards this season. He had his first multi-touchdown rushing game of his career, scoring twice against Kent State on nine carries and logged career highs of four catches and 43 receiving yards. I think he needs to be effective this week for the Cardinals to win this game. It’s looking as though the Cardinals will be without their leading receiver Jaylen Smith this week. But this is the deepest unit on this team. The Cardinals had 14 different players catch a pass in last Saturdays game and guys like Dez Fitzpatrick have answered the call. Through five games, Fitzpatrick leads all freshmen nationally with six touchdown receptions and ranks sixth among all players, while also leading the ACC. He is one of those guys that gravitates to the spotlight. I think he will be big in the game on Thursday. The Louisville offense will face another one of the top defensive lines in the country. The Wolfpack leads the FBS in returning defensive senior starters in 2017 and most of those guys are on the defensive line. They are led by defensive end Bradley Chubb (29 tackles), who ranks second nationally in tackles for loss and ninth in sacks. and Senior linebacker Jerod Fernandez and leads the team with 44 stops for the season and was the single-game tackle leader versus South Carolina (9), Florida State (9) and Syracuse (a career-best 14). These guys help power an NC State defense that is eighth against the run allowing 85.6 yards per game. This Wolfpack defensive unit has solid depth in almost every area. One point of some concern for them is the defensive secondary. So far, this season, five players have started for the first time at a position in the secondary in the first five games. I’m hoping that with more time to get comfortable with his receivers that Lamar Jackson and company can expose them here. But first the Cardinals are going to have to deal with that strong defensive front. The Cardinals were not able to handle a similar defensive group from Clemson and this will be a similar test. After all that has transpired over the last two weeks it will be hard for me not to think about Tom Jurich while watching yet another big Thursday night game. The national rise of the Louisville football program can be directly linked to his willingness to be a part of ESPN’s weekly college football games. Jurich was quoted after he was hired saying “The thing we need to do right away is to get exposure and get this program branded, and that is something I feel is most essential.” He did that on this platform. Thinking back about those games I’m reminded of all the highs and lows I’ve felt on Thursday nights over the last 16 years. The field goal at Rutgers was probably the biggest low, but that was replaced by many highs including the Thursday night win against Rutgers that got us to the Sugar Bowl. And that game three years ago against Cincinnati. All those heroic performances by Teddy and other Cardinal greats the memories just go on and on. They laughed at Tom for playing the Thursday night games but who’s laughing now. This is a big game for this team and one that I feel is a must win for them to finish out strong. The last big test that this group passed was the big win against FSU. Since then the build up to this kind of big game has been great but the team hasn’t delivered. I do think they have put the Clemson loss in the rear view and think they will have too much speed and talent on the field for NC State to keep up with. We get All American Jaire Alexander back and that won’t hurt either. Enjoy it folks! GO Cards!